"Floating Hearts Grandmother's Necklace, Personalized for Two Grandchildren"
This endearing necklace will be cherished forever. It is so pure and simple. A heart for each of your grandchildren~ what could be better than that? What a wonderful personalized necklace. The price is for a chain plus two hearts. If you add birthstones the price will increase. A simple necklace which holds so much meaning. This necklace comes with two hearts to signify your precious grandkids ~ each will float on our dainty chain. Add a little color with a 4mm birthstone crystal. Each is wire wrapped on the hearts to represent the birth month. 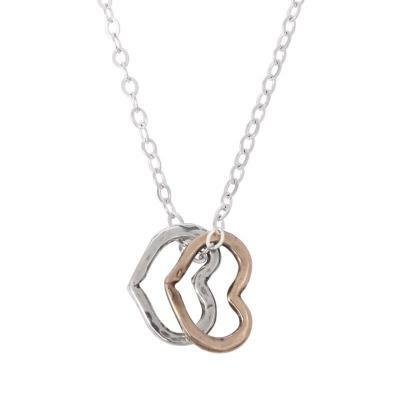 The Floating Heart necklace makes a wonderful gift for a grandmother of two. You can choose sterling hearts for the girls and bronze heart for the boys or vice versa. You can design this necklace with or without birthstones. This necklace comes with two floating hearts. You can add birthstones for $5 each.The dainty chain is made of sterling silver. The hearts are available in sterling silver or bronze. The crystals are 4 mm Austrian crystal. Heart is 5/16" by 1/2".